A seemingly random detail of the ubiquitous sensory overload which is Mexico City. The corner of a street, with cars passing by, and in the road, a bird’s cadaver. 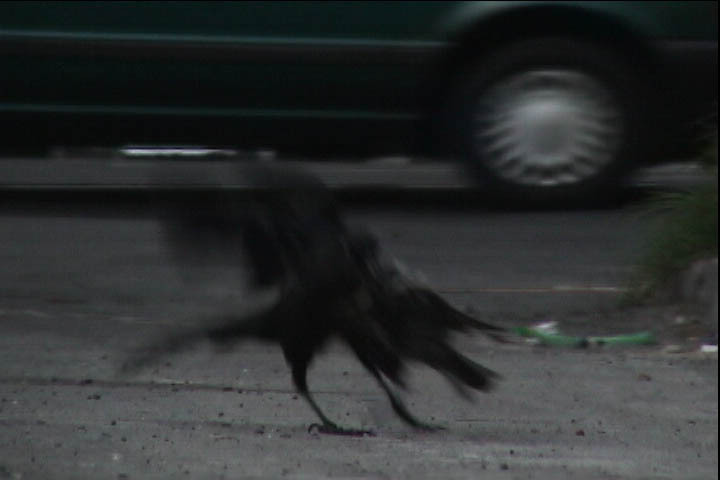 After some time, a raven appears, eyeballing the conspecific’s corpse, then laying it out. The bird prepares the coup. A small moment of complete concentration. Then the raven clasps its prey and flies away with it. Jens Kull: Left Over (2008) (still). Image courtesy of Jens Kull. All rights reserved. Left Over, for one, is a documentation of a tiny hazardous moment. The scene depicts a small detail, a fragment of life in the supermetropolis. It is a glimpse that you only get if you wander the streets with an open, waking eye. The loudness, the sheer number of people and interactions, the sensory overkill of the city which only makes aware for the superficial is broken in its impermeability for that one special moment, where you literally see through the apparent and look through to what lies underneath: the daily struggle, the fight, the survival, the renewal, consumption which brings production which brings consumption, death and rebirth. It is in one special moment, after aligning the prey and getting prepared for take-off, when for a split second the eye of the scavenger is visible to the camera, where everything surrounding, the cars, the traffic, the noise steps back and makes way for the glimpse: the universe, sense, meaning, power and subjugation concentrate in this one instant. Here, we see determination at its best, and this is the moment when we are touched by everything, when we are confronted with the gateway to more things between Heaven and Earth than are dreamt of in our philosophy. To grasp a moment like this, to foresee it and place a camera proves an outstanding ability to look beyond things, to concentrate on the details which constitute the sensory mayhem of a city with 22 million inhabitants. It is these details which are hidden to most human eyes, and yet it is a moment so powerful that it seems it should be shouting out. But it is not. It is reserved to those who do not only look but see. Jens Kull makes this moment perceptible to the viewer. Left Over is a simple recording of a special instant. But it is the right moment and the right time. It goes so deep because it demonstrates what is going on in that part of the world which we constantly filter in order to concentrate on what we believe is important.